And he hopes talks take place according to Spanish constitution. Prime Minister Justin Trudeau speaks to the media about changes to the Canada Child Benefit on Oct. 27, 2017 in Saint Bruno-de-Montarville, Que. SAINT BRUNO-DE-MONTARVILE, Que. — Canada supports an undivided Spain, Prime Minister Justin Trudeau said Friday in response to the Catalan regional parliament in Barcelona passing a motion unilaterally establishing a new country. "Canada recognizes one united Spain," Trudeau said in Saint-Bruno-de-Montarville, just east of Montreal. "We understand there are significant internal discussions that they are going through right now and we simply call for those discussions to be done according to the rule of law, according to the Spanish constitution, according to the principles of international law. "But mostly that those conversations and discussions happen in a peaceful, non-violent way." In response to Friday's independence motion, Spain fired the Catalan president and dissolved the regional parliament. 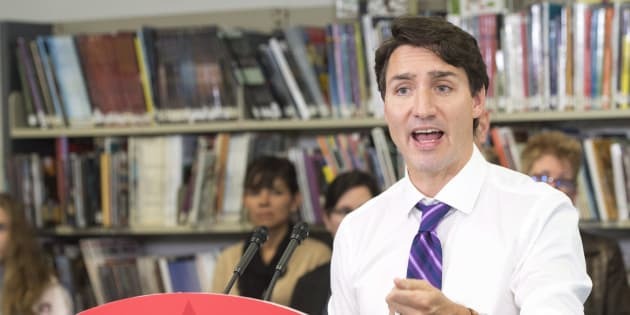 Earlier in the day, Bloc Quebecois Leader Martine Ouellet responded to remarks made by Andrew Leslie, parliamentary secretary to the foreign affairs minister, which were similar to those Trudeau would make later. Ouellet called on Canada to recognize an independent Catalonia, saying she hopes the government would "adjust" its stance "because it's not very classy to take a position like that." The Quebec sovereigntist leader said Canada doesn't shy away from "giving lessons" to countries in Africa, Asia or South America that have seen violence erupt after contested votes. "And then, all of a sudden, because it's happening in Europe, (Canada) wants to protect the status quo?" Ouellet asked. "It's troubling." The Conservative party, which has been relatively quiet on the issue since the crisis in Spain began, said it was up to the federal government to take a position. "It's an extremely complex subject," said Tory MP Alain Rayes. "There is no simple answer. It's an issue for the government." Quebec Premier Philippe Couillard reacted to the Catalan government's declaration by citing a motion passed in the provincial legislature on Oct. 4 that called for the crisis to be solved peacefully. "It's not up to Quebec to interfere in this political debate or to dictate what the way forward should be," Couillard said in a statement. "We still believe political and democratic dialogue is essential to resolve this impasse."